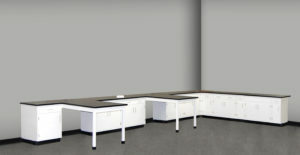 Laboratory Furniture Materials–Which one is for you? Easy to manufacture, plastic laminate casework is a less expensive and cost-effective material. Plastic laminate offers a wide variety of colors, textures, and patterns. It is an attractive choice and comes in handy in situations where design is important. Also, this material absorbs sound better than metal, so in situations that require a quiet atmosphere, plastic laminate may be a great option. Metal provides a sturdy, cost-effective option and is frequently used in the commercial markets. It is very durable and can withstand more abuse than other materials, but will not compliment all applications. Metal is very utilitarian, easy to maintain, and makes cleaning a breeze. Polypropylene materials provide high acid resistance. With no metal exposed on polypropylene furniture, there will be no worries about rust or corrosion. Polypropylene casework also provides superior spill containment and is well-suited for sterile and surgical areas. As a stain-resistant material, polypropylene retains its strength and color for many years. Wood casework adds a touch of warmth to any environment as it is long-lasting and provides many options. From maple to oak, by finding the right finish you can secure a professional look for your laboratory. Wood materials are constructed using time-honored construction techniques leading to high-quality products. And wood is an ideal choice for any application that uses chemicals that corrode metals or are that non-conducive to metals. Phenolic Resin is a durable and rugged material that is resistant to many acids and solvents. They can come in a variety of color choices and are very durable in high-moisture areas. Also rust-resistant, phenolic resin materials are easy to clean, maintain, and are virtually maintenance free. Resistant to most bacteria and fungus growth, these are suitable for many areas but commonly found in lab/hospital settings including operating suites, sterile areas, nurse stations, and dialysis treatment areas. Great for wet environments, stainless steel casework is extremely durable while being rust and stain resistant. This work surface provides excellent chemical and heat resistance and is easily cleaned. Adaptable to any color scheme or decor, stainless steel casework is a popular choice in many biological, biomedical, pharmaceutical, and hospital labs. The style of furniture is one thing, but furniture materials will determine the durability and effectiveness of your laboratory. 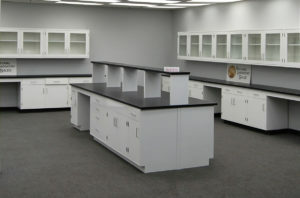 Since every laboratory is different and the work being performed is diverse, it is imperative to select the proper materials for your unique environment. A knowledgeable lab design professional can help you make the choice that is right for your situation, and your budget. Contact National Laboratory Sales today and speak with a design expert who will listen to your needs and find the perfect equipment and casework for your laboratory.